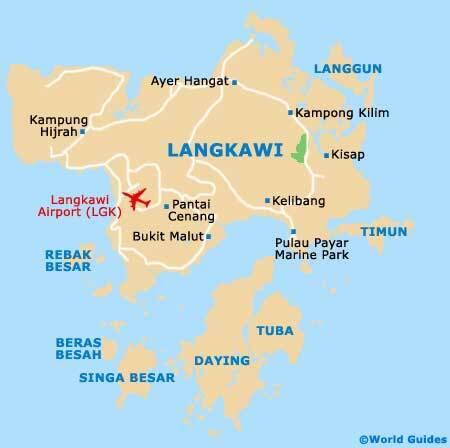 Kuah town and the main beaches of Pantai Cenang and Pantai Kok (located in the south-west) have the bulk of the accommodation in Langkawi. Cenang Beach boasts the best choice of the hotels and resorts, while the northern coast (particularly in the north-west) has the most exclusive resorts. Many of the larger hotels pamper tourists, with excellent quality rooms and food, plus extras like spas and golf courses. Cenang also has a decent range of budget and midrange lodging, as does the town of Kuah. As well as having fine beaches, Pantai Cenang and Pantai Kok are the most common hotel options for tourists, as they are also built up (for Langkawi) and are close to the airport. Kok Beach (Pantai Kok) is a little cheaper than Cenang, although there is less choice. Kuah is a better bet for those who prefer bustle and to be near the island's best shopping. While not having the most exclusive hotels, Kuah has good options for mid-range and budget accommodation, suiting most pockets. Kuah also offers a bit of flair in its bazaars and local life. The top-end resorts are the likes of the Langkawi Lagoon Resort, the Berjaya Langkawi Beach and the Datai Resort. The latter is to be found at Datai Beach in the north-west and comes with an 18-hole championship golf course. You can expect first class facilities, with swimming pools, spas, health clubs, and so on.